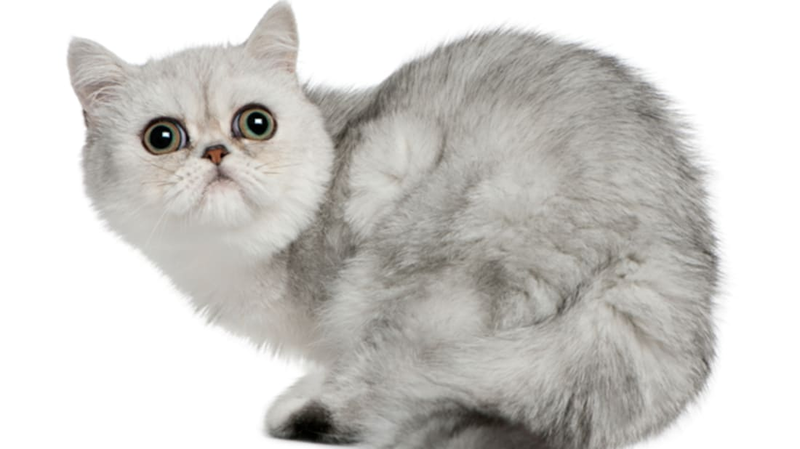 Love the Persian’s sweet, docile personality, but don’t want to deal with the hassle of keeping its coat tangle-free? Consider owning an Exotic Shorthair, also known as the Exotic. The breed is nearly identical to the Persian, save one big difference—it has short fur. Here are seven facts about the friendly, flat-faced kitty. 1. THE EXOTIC SHORTHAIR IS A RELATIVELY NEW BREED. There are a few tales regarding the Exotic Shorthair's origins, but this one's the most common: Sometime in the 1950s or 1960s, American Shorthair breeders decided to mate their cats with silver, green-eyed Persians to create short-haired felines with the same lovely coloring. The resulting kittens didn’t resemble their American Shorthair parents. In fact, with their flat faces, round, stocky bodies, and snub noses, they looked more like Persians. A breeder named Jane Martinke took notice of the cats, and in 1966 she proposed to the directors of the world's largest registry of pedigreed cats, the Cat Fancier Association (CFA), that the unique shorthairs be used to create a new breed. Cat fanciers originally proposed that the new breed be named the “Sterling,” since the original breed standard called for the cats to be silver. However, the cat was called the Exotic Shorthair instead, because the grey-ish coloring was new and “exotic” among American Shorthairs. Eventually, the breed standard was opened up to include cats of all colors and patterns. Over the years, breeders outcrossed Exotic Shorthairs with Burmese and other cats to perfect its short, plush coat. The offspring were later mated back to Persians, resulting in the modern Exotic Shorthair breed. Today, the CFA simply refers to the cat as "the Exotic," whereas other cat organizations around the world still call it the Exotic Shorthair. The Exotic Shorthair’s fur is short, but plush. That’s because the kitty has a double-layer coat, with a thick, downy under-layer that lifts the topcoat away from the body. This trait is inherited from the Exotic’s Persian ancestors, and is unique among the various shorthair breeds. 3. THE EXOTIC SHORTHAIR IS (RELATIVELY) LOW-MAINTENANCE. The Exotic’s low-maintenance coat doesn't shed much, so owners only have to give it a weekly comb. However, owners do have to wipe and clean the cat's eyes, which, thanks to its flat, pansy-like face, are prone toward tearing up and staining its fur. The Exotic can also experience sinus issues, or problems with tooth alignment due to its shortened jaw. And because of its short nostrils and heavy coat, it's very sensitive to heat. 4. EXOTIC SHORTHAIRS ARE MELLOW CATS. Persians are so placid that they’re often referred to as “furniture with fur.” The Exotic Shorthair has a similarly mellow personality, but thanks to its shorthair ancestors, it's a lot livelier than the Persian. 5. EXOTIC SHORTHAIRS COME IN ALL SHADES AND PATTERNS. Exotic Shorthairs come in all patterns and colors, ranging from black, white, blue, and tabby to Calico and a Siamese-like color point coat. As for their eyes, they range from either blue or blue-green to brilliant copper, depending on the cat's coat [PDF]. 6. EXOTIC SHORTHAIRS AREN'T FAT—JUST BIG-BONED. With their thick, short-legged bodies, wide necks, and large heads, the Exotic Shorthair looks kind of pudgy. The Exotic can weigh up to 15 pounds, but most of this weight is due to its dense bones—not because it's actually fat. 7. EXOTIC SHORTHAIRS REGULARLY GRACE THE SMALL SCREEN, THE SILVER SCREEN, AND COMPUTER SCREENS. With their adorable, teddy bear-like appearances, it’s no wonder that the Exotic Shorthair is regularly featured in movies, TV shows, and viral Internet memes. In the movie Cats & Dogs (2001) and its sequel, Cats & Dogs: The Revenge of Kitty Galore (2010), the evil Persian villain, Mr. Tinkles, has an Exotic Shorthair sidekick named Calico. On the Fox sitcom New Girl, the character Winston adopts an ex-girlfriend’s Exotic Shorthair named Ferguson, who quickly becomes his best friend. Meanwhile, two famous Internet cats, Pudge the Cat and Snoopy, are Exotic Shorthairs.